Chad Allen has been breaking hearts and barriers since he debuted on the TV series Our House as a teen and later as young adult on Dr. Quinn: Medicine Woman. Long before it was in vogue to do so, he came out publicly and has been a vocal advocate for gay and human rights, and particularly for people living with HIV. 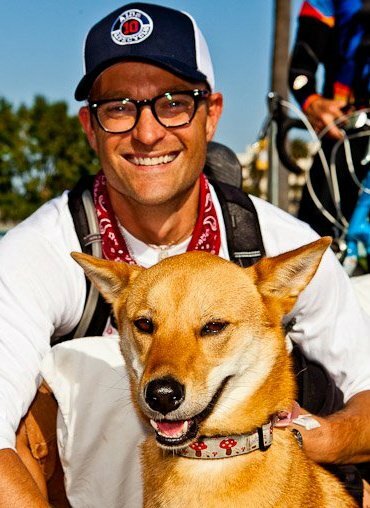 This fall, Allen takes this advocacy to the next level, when he will participate in the 2014 Sydney Marathon, raising over $10,000 for AIDS Project Los Angeles helping to save the lives of men and women living with HIV. How did you get involved with AIDS Project Los Angeles? I have been involved with AIDS Project Los Angeles as an actor/fundraiser for over 20 years participating in countless events here in LA. But after riding in six AIDS/life-cycles (545 mile bike rides from San Fran to LA to raise money for the LA Gay and Lesbian Centers HIV/AIDS services), I was looking for a new challenge and service opportunity that wouldn't take me away during finals. I had done my first triathlon and T2 (Team to end AIDS) was doing their first triathlon to benefit APLA. I signed up, trained and that got me into running for the first time in my life... I actually had a spinal disk rupture during tri-training and had surgery before that first tri, and I wasn't able to race. To be honest I didn't know if i'd ever run or bike again. Committing to the idea of raising money for APLA and running the Disney half marathon in winter 2013 gave me a goal to get through the endless recovery and physical therapy. I ran that race for APLA, and it was amazing. For my 40th birthday I wanted to find an awesome challenge to raise some real money with. When the Sydney marathon came up, since I've always wanted to go to Australia and I've never run a marathon before. I knew I was in. Tell me about the members of your team, how did you guys get together? The team is a very small group of high fundraisers, all of whom -- I believe -- have run marathons before. I am actually the only first timer. Eeeek. They're a fantastic and supportive group of about 10, mixed gender, age, sexuality and skill levels specifically brought together for their passion and ability to raise good amounts for the cause. How long is the marathon? 26.2 miles. Olympic marathon distance and the course we are running is the same as the Sydney games a few years back. They say its extraordinarily beautiful! Nope. It's a dream of mine since I was a kid. Everyone who knows me and knows Australia says I'll want to stay. I've heard that my whole life. I can't wait!